How do I manage catalog listings? 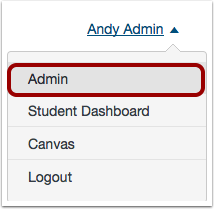 As a Catalog admin, you can manage all courses and programs in Canvas Catalog on the Listings page. The Listings page shows an overview and status of all course and program listings. You can also add a new course or program. An institution's catalog is always public facing, even if students are not logged in. However, institutions can manage the visibility of each listing in their catalog. 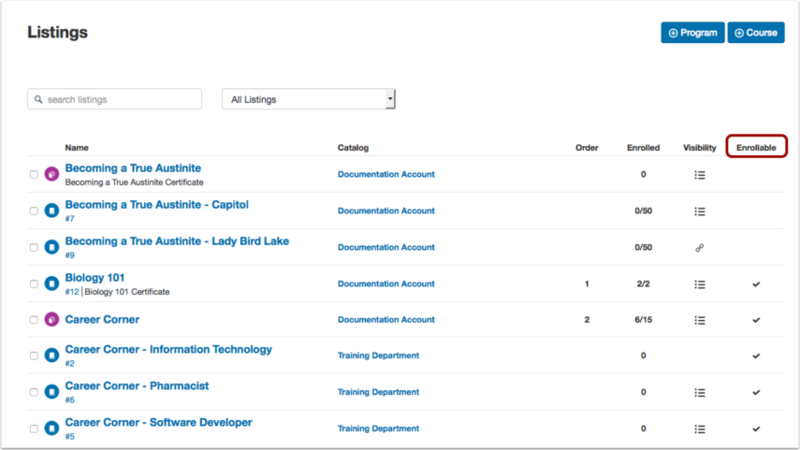 By default, the admin console opens to the Listings page and displays all items in Canvas Catalog. By default, Canvas Catalog displays all catalog items. 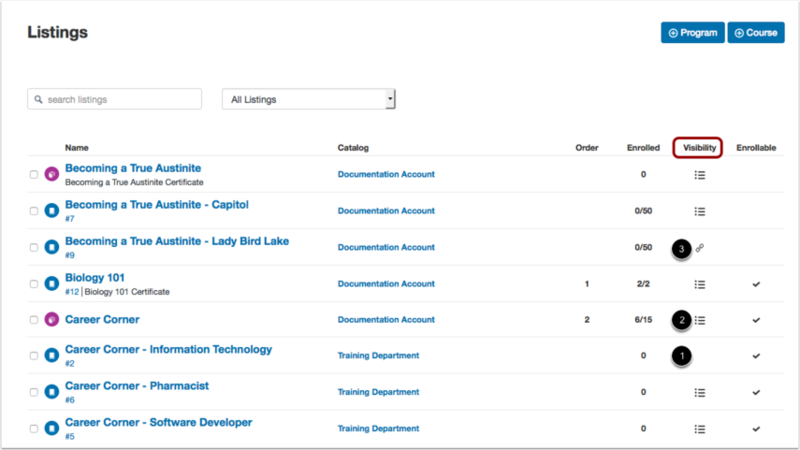 You can sort catalog listings by searching for a listing in the search field  or sorting by courses or programs in the Listings menu . 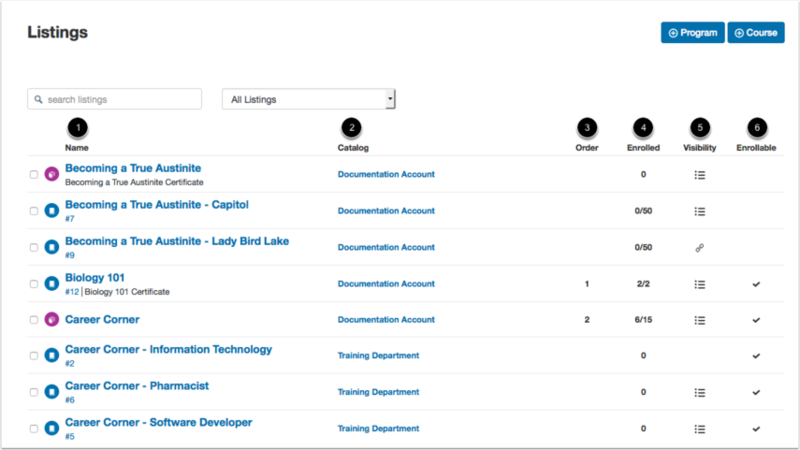 Each listing displays the listing name , listing catalog , listing order , enrollment count , visibility status , and enrollment status . Courses vs Programs: Each listing name displays an icon for the type of listing: course  or program . Course listing details are preceded with a numbered link, which is the number of the course as linked to your Canvas account . To quickly open the Canvas course in a new browser window, click the number. Certificates: If a certificate has been added to the listing, you can view the name of the certificate . The Catalog column shows the name of the catalog. You can access the catalog details page by clicking the catalog name. 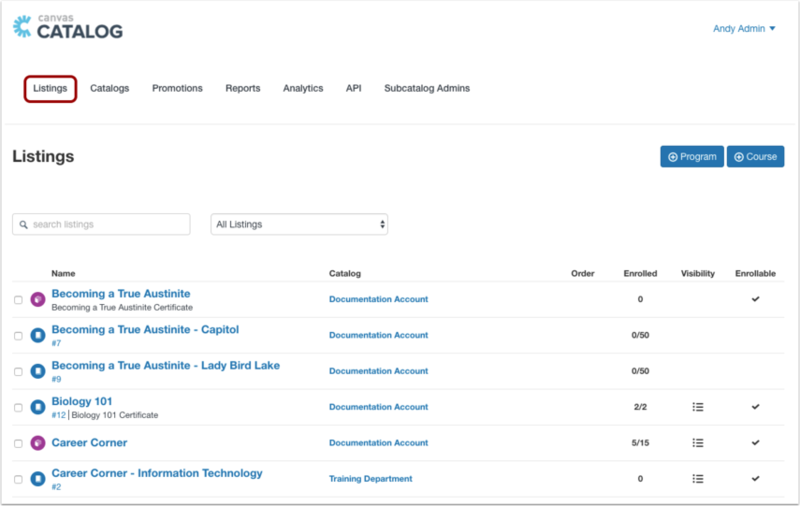 The Order column shows the order that the listings display within the Catalog when they are listed (visible) in the Catalog. Setting an order shows priority in the Catalog; if a listing does not include an order number, the listing will appear after all other visible priority listings. The Enrolled column displays the number of users enrolled for the listing . If a listing contains a fraction in the enrollment column, the listing includes an enrollment limit . You can view the current number of enrollments compared to the maximum number of enrollments. The Enrollable column shows if the listing is open for enrollment. A check mark means enrollment is open. To view the details of a listing, click the name of the listing. To add a program listing, click the Add Program button . To add a course listing, click the Add Course button . To manage an existing listing, click the check mark next to the listing . 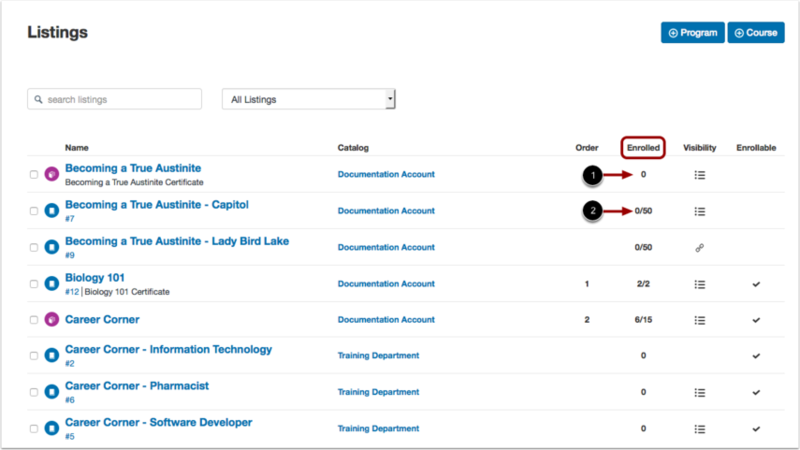 You can select more than one listing if you want to manage multiple listings at the same time. In the Actions menu , select a management option. You can change visibility settings, change enrollment settings, and delete the listing(s). Previous Topic:How do I add a category to a catalog? 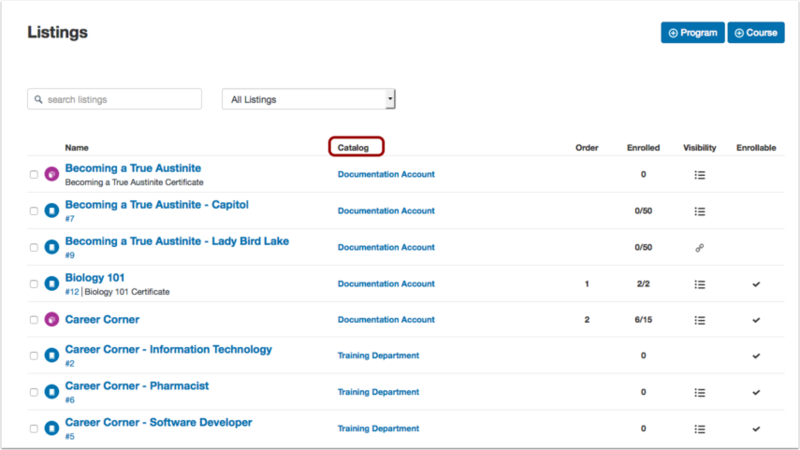 Next Topic:How do I add a catalog course listing? 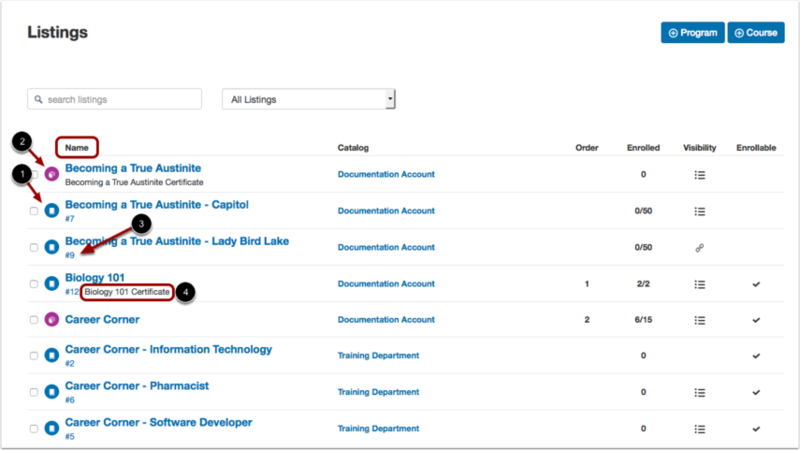 Table of Contents > Admins - Catalog > How do I manage catalog listings?